The New York Times’ Jodi Rudoren once again took to the front pages of the paper to decry the building of Jewish homes in lands the Palestinians want for a future state. 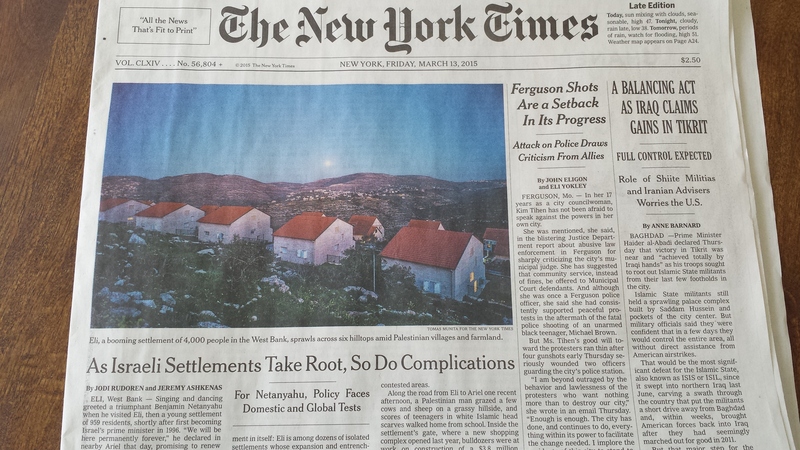 In the March 12 cover story she wrote: “Steady growth of settlements across the occupied West Bank and East Jerusalem, which most world leaders consider violations of international law, complicates both the creation of a viable Palestine and the challenge of someday uprooting Israelis, who are now raising a second and third generation in contested areas.” The thousand-plus word article detailed the size of various towns and the number of Jews living there, but never once discussed how the presence of Jews “complicates the creation of a viable Palestine.” Thomas Friedman echoed the sentiment on March 18, 2015 op-ed piece where he wrote “some 350,000 settlers are now living in the West Bank, makes it hard to see how a viable two-state solution is possible anymore.“ Let me spell out what they suggested. Palestinians are not simply seeking the establishment of a new country where they can be self-governing; they seek a country devoid of Jews. It is as though the presence of Jews triggers some sort of terrible anaphylactic shock to the Palestinian people. In 2013, acting Palestinian President Mahmoud Abbas declared that “we would not see the presence of a single Israeli – civilian or soldier – on our lands.” For some reason, Abbas abhors the presence of Jews. This would appear to be the rationale for the media thinking that Jews risk the viability of a Palestinian state. Ignoring for the moment the glaring anti-Semitic nature of the Abbas’s desire, consider the number of Jews that could potentially live in a new state of Palestine. Small Percentage: Jews account for roughly 40% of the population in the eastern part of Jerusalem; about 13% of the remainder of the west bank of the Jordan River (WBJR), and 0% of Gaza. 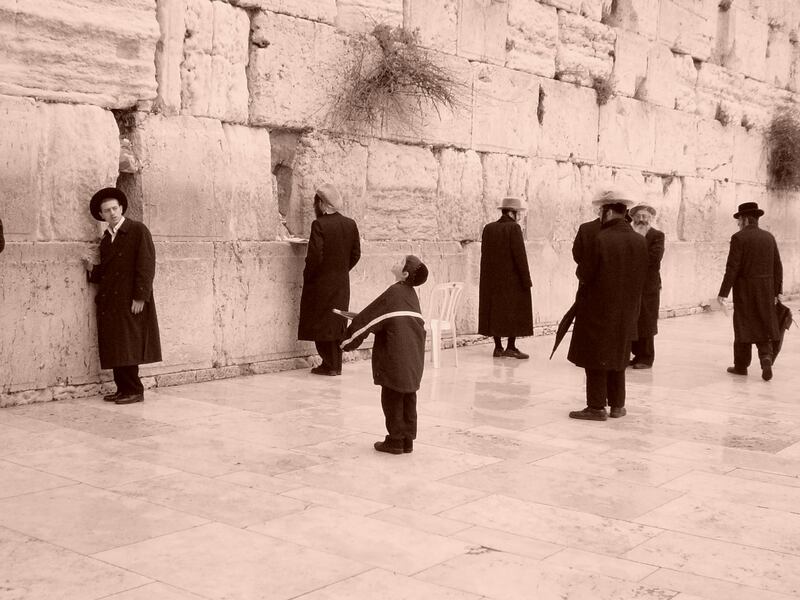 Ignoring the eastern part of Jerusalem which Israel annexed, Jews account for 8% of the population in the territories. If a portion of the Palestinian population living around the world (estimated at 7 million people) moved to a new state of Palestine – say 2 million of them – the total percentage of Jews would drop to 5%. If land swaps with Israel would move blocks of towns with Jews to Israel, the percentage would drop into the very low single digits. Is this truly a sticking point for Abbas? Does he need a country to be completely Judenfrei like Nazi Germany? Would a Jewish population of 2-3% make a state non-viable? Maybe he should look at Israel, which seems to do fine with non-Jewish citizens, which account for 25% of the country’s population. Umm al-Fahm in Israel is a city of nearly 50,000, almost all of whom are Israeli Arabs. Nazareth, with a population of about 66,000 is also completely Arab. Haifa, one of Israel’s largest cities, has a 24% Arab population. The Arab presence doesn’t offend Israelis and doesn’t impact the “viability” of Israel, and they account for 10 times as large a group as Jews would in a new country of Palestine. “Uprooting Israelis”: Roduren wrote that it will be difficult to move hundreds of thousands of Jewish Israelis from their homes. She is right: such a massive expulsion would dwarf the evictions of Israelis from the Sinai in 1982 and Gaza in 2005. The situation here is also completely different. When Israel took Sinai from Egypt in the 1967 war, it was new territory. It was never part of the holy land to Jews and was not part of the 1922 Palestine Mandate which established a Jewish homeland in Palestine. The 4500 Israelis that lived in the Sinai who were evicted by the Israeli government as part of a peace treaty were new transplants to the region. When Israel evacuated the 21 settlements in Gaza in 2005, it was much harder. Gaza was part of Palestine and is featured in the bible. However, it was never home to many Jews at any point in its history. 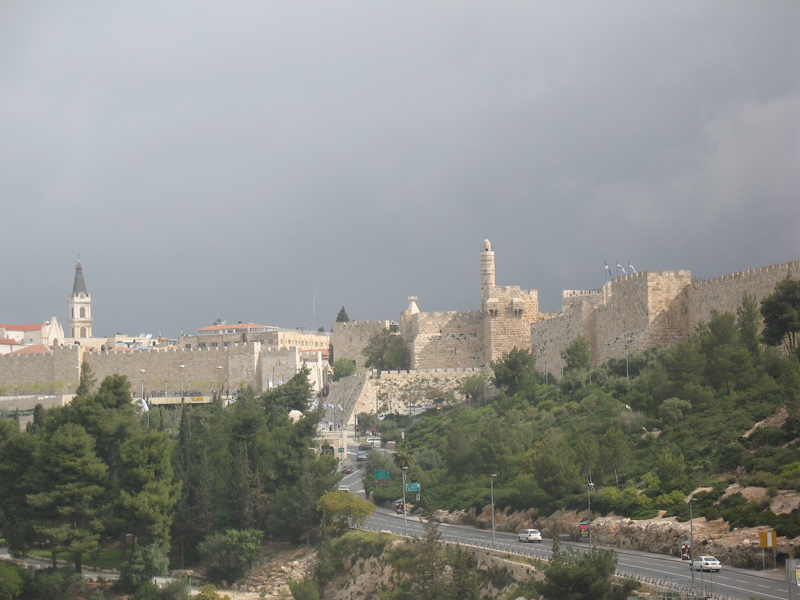 The WBJR (plus additional area) is known as Judea and Samaria. It has ALWAYS been part of the Jewish history and Jews have always lived throughout the area, except for brief periods of time when they were evicted and banned (such as when Jordanian and Palestinian Arabs controlled the area from 1949-67). The area was an integral part of the 1922 British Mandate of Palestine which established a Jewish homeland. When Israel legally counter-attacked the Jordanians in 1967, it removed the racist ban of Jews in the land that the Jordanians put in place, after they evicted all of the Jews counter to the Fourth Geneva Convention. In 1967, Israel allowed Jews to return to live in lands they had always lived in. The “complication” of “someday uprooting” hundreds of thousands of Israelis living in WBJR is not about the sheer size of the numbers. These residents belong there and should never be evicted or forced to leave at all. Article 18: Freedom of belief and the performance of religious rituals are guaranteed, provided that they do not violate public order or public morals.It is interesting (telling? ), that the Palestinians would guarantee the freedom of religion, as long as there are no Jews living in the land. Other media sources claim that the threat to a viable Palestinian state is not because of the presence of Jews, but because of the remaining configuration of the land. 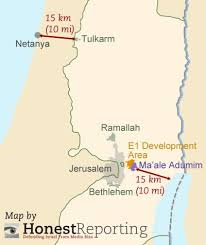 The “bisection of the West Bank” that the article claims refers to the distance from Maale Adumim to the Jordan River which would be only 15 kilometers. This would be the narrowest spot of WBJR. It would happen at only a single spot in the middle of the Judean Desert before widening by many miles. 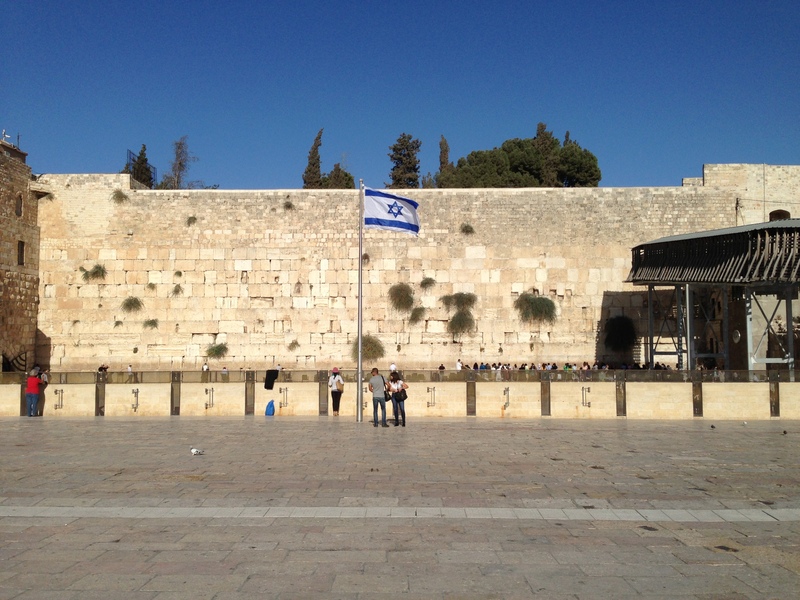 Israel’s narrowest spot is that same 15 kilometers across, except it stays narrow for several miles. Further, that narrow stretch runs along Israel’s main population and commercial center near Tel Aviv. This compares to the WBJR which is mostly unpopulated desert land. Is a single narrow stretch of land so catastrophic that Palestine would not be viable? Should that be true, Abbas must believe that much of the spine of the country which sits in the hills of eastern “West Bank” should be annexed by Israel to make sure it becomes viable, just as Bayit Yehudi’s Naftali Bennett suggests. In short, if Abbas feels that the issue of a “viable” state is because a handful of Jews cannot live in Palestine, then by definition, the “Right of Return” of millions of Arabs to Israel cannot be permitted or it would destroy Israel. Similarly, if the threat of viability stems from “bisecting” the land, then Israel would need to annex the entire middle of the country. There are many paths to a viable country which include building an economy and ensuring security. Neither of those are accomplished by banning Jews from living in the land. It is well past time for Abbas to continue to make such racist claims; it is disgraceful that western media continues to blindly repeat it. This entry was posted in Gaza, Israel, Middle East Analysis, Palestinians, West Bank and tagged eviction, Israel, Palestinian President Mahmoud Abbas, Palestinian State, settlements by First.One.Through. Bookmark the permalink. Anyone or any publication that, in 2015, still proposes a “Juden-rein” state such as “Philistine” has an opinion that is eerily similar to that of the racist Nazi’s. Pingback: Israeli Peace Process v Palestinian Divorce Proceedings.